In the latest sign of how determined the Americans are to come out on top in this year’s Ryder Cup, Jack Nicklaus and his wife Barbara last night hosted a team-building dinner. The event, held at the couple’s home in North Palm Beach in Florida, was attended by 22 potential Ryder Cup players as well as US captain Davis Love III and his three vice captains, Jim Furyk, Tom Lehman and Tiger Woods. “Jack and Barbara were incredibly gracious, opening their home to myself, our vice captains and many potential US Ryder Cup players,” said Love, who will lock horns with Darren Clarke at Hazeltine in September. The gathering followed the opening round of the Honda Classic at PGA National, which is also in Palm Beach Gardens. It was attended by past US Ryder Cup players in Keegan Bradley, Jason Dufner, Rickie Fowler, Dustin Johnson, Phil Mickelson and Jimmy Walker. They were joined by potential rookies in Zac Blair, Tony Finau, Brian Harman, Russell Henley, Billy Horschel, John Huh, Chris Kirk, Kevin Kisner, Brooks Koepka, Jason Kokrak, Jamie Lovemark, Andrew Loupe, Ben Martin, Brendan Steele, Robert Streb and Gary Woodland. Also in attendance was PGA Ryder Cup committee member Pete Bevacqua. The early team-building exercise is one of many things to have come out of the taskforce set up by the Americans following a heavy defeat at Gleneagles in 2014. Appointed as captain for a second stint after already holding the reins at Medinah in 2012, Love is trying to improve on a record that has seen the US win just two of the last ten biennial matches. Jamie McLeary is targetting a second successive top-10 finish on the European Tour after opening two sub-par rounds in the ISPS Handa Perth International. The 34-year-old added a 69 to his opening 71 at Lake Karrinyup to sit joint-19th in the clubhouse on four-under, seven behind joint-leaders Peter Uihlein and Brett Rumford. McLeary birdied four of his first six holes before dropping shots at the ninth and 12th then birdied 13th and 15th only to take a bogey at the 17th. 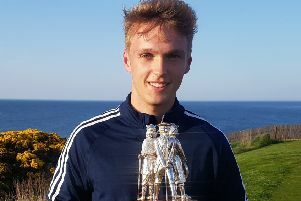 “I got off to a hot start but kind of struggled to keep stupid bogeys off my card thereafter,” said the Bonnyrigg-based player. “It was pretty windy for most of round today until end, when the wind died down, so it wasn’t the greatest draw in the world given that I played in the wind on Thursday afternoon. McLeary chalked up a career-first European Tour top 10 when he finished joint-seventh in the Tshwane Open in South Africa just under a fortnight ago. “I’m hoping to finish top five, so I’m definitely into Thailand next week,” he added. That’s the aim at the moment. Hopefully I can achieve that and more. Stephen Gallacher withdrew due to an ongoing hand problem after the opening round, leaving David Drysdale as the only other Scot still in the event. A later starter today, he was two-under for the day and five-under overall, sitting joint eighth, with five holes to play. Pamela Pretswell will be flying the Saltire solo in the final two rounds of the RACV Ladies Masters at the Royal Pines Resort on the Gold Coast. The 26-year-old had been in danger of missing the cut after an opening 77 but bounced back with a three-under 70 in today’s second round. It left her sitting joint-36th on one-over, 11 shots behind the joint-leaders, Swede Camilla Lennarth and Dane Nicole Broch Larsen. “I’m very happy,” admitted Pretswell after making three crucial birdies in five holes on her back nine. “Yesterday I played ok, but just was a little untidy around the greens. It felt like early-season rustiness. “Today my target was -3 to get back to +1 as thought that would be the cut line, but it has now moved to +4. This is the Hamilton-based player’s first event since she was forced to withdraw from the final round of the New Zealand Ladies Open with a back injury, which also led to her sitting out a qualifier for last week’s Australian Women’s Open. Sitting joint-10th after her first-round 70, Kylie Walker crashed out of the event following an 84, the main damage in which was caused by a quadruple-bogey 7 at the second. There were also early exits for Sally Watson (76-77) and Heather MacRae (77-80) as the cut fell at four-over.